Many lobbyists come to the Pennsylvania State Capitol to lobby for their clients – but only a handful also help elect the officials they lobby. HARRISBURG — In the last three years, the campaign arm of a powerful Harrisburg lobbying firm has helped elect or reelect a third of the Republicans who now dominate the Pennsylvania Senate. Across the Capitol in the House, the campaign offshoot of another lobbying firm has helped nearly half the GOP members who hold a commanding majority in that chamber. Once they get their candidates into office, both firms then lobby them on behalf of a long list of special interests. Critics call it the lobbying world's version of the double dip. 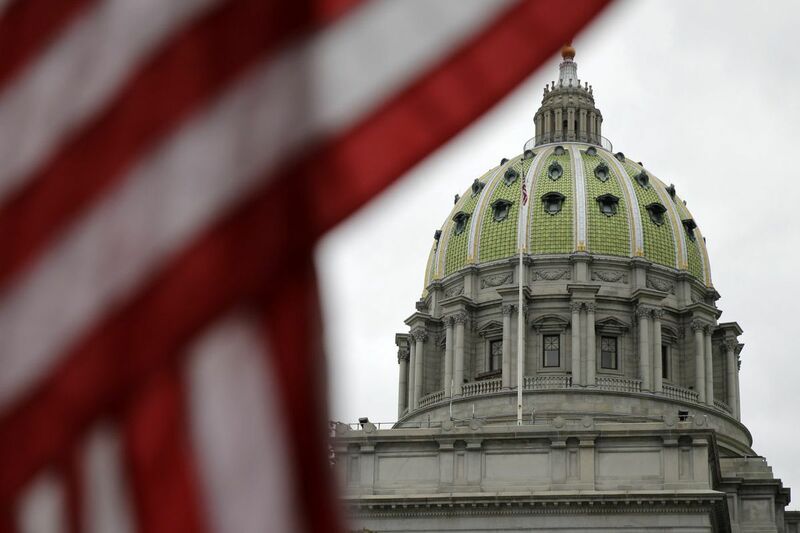 They have pushed, with little success, to ban the practice, arguing that it perpetuates a culture of favoritism and undue access in Harrisburg and normalizes chummy relationships between lobbyists and lawmakers. Founders of the two firms counter that their work is legal and protected by the First Amendment. What is unequivocal: Legislative measures to ban the practice — including one as recently as this summer – have stalled or failed. "Lobbyists have a defined benefit for what they do for their clients — and it should be totally separate from campaigns," said Rep. Brandon Neuman (D., Washington), the latest lawmaker to seek a ban. "It's a public-perception issue and it's a good-government issue." For years, lobbying in Pennsylvania was a secretive business, and more recently attracted scrutiny from federal investigators. A decade-old law strengthened registration and reporting requirements for lobbyists and their clients, but the state still lags behind others in transparency and accountability, according to an analysis of lobbying laws compiled by the National Conference of State Legislatures. Among Harrisburg's high-powered partnerships, only two have well-established campaign arms that, for the last decade, have dominated the market on both electing and lobbying Republicans who drive public policy. Long, Nyquist & Associates, a lobbying firm run by onetime top Senate staffers Mike Long and Todd Nyquist, has a sister company called LN Consulting that manages campaigns for offices ranging from Congress to the Pennsylvania Supreme Court. Its founders maintain deep ties to Senate Republican leaders and, campaign records show, many GOP senators turn to LN Consulting for election help. Of the 34 Republicans in the 50-seat Senate, LN Consulting has helped run the political campaigns of 11 senators. Maverick Strategies, a lobbying firm founded by Harrisburg-area political consultant Ray Zaborney, has a political arm called Red Maverick Media and a fund-raising offshoot, Maverick Finance, founded and run by his wife, Jen. Maverick's political work runs the gamut, but a sizable chunk is dedicated to electing Republicans to the House. Maverick has worked for 57 of the 121 GOP members in the 203-seat House. Maverick's campaign and fund-raising arms also worked on the campaigns of 16 senators. That has translated into big money. Together, LN Consulting, Red Maverick, and Maverick Finance have been paid at least $9.8 million since Jan. 1, 2014, by legislative candidates, the state party, state legislative campaign committees and PACs, an Inquirer/Daily News/Post Gazette analysis shows. That includes political work for many of the legislature's leaders, among them, Senate President Pro Tempore Joe Scarnati (R., Jefferson), Senate Majority Leader Jake Corman (R., Centre), House Speaker Mike Turzai (R., Allegheny), and House Majority Leader Dave Reed (R., Indiana). During that same period, lobbying disclosure reports show, Long Nyquist and Zaborney's clients have spent tens of millions of dollars fighting against or pushing legislation. Their clients range from casinos to the Catholic Church, and from power-plant owners to medical-marijuana growers. It is not clear which legislators they spent the most money on, or how much they spent on them. That is because Pennsylvania's lobbying disclosure law, unlike other states, lacks the teeth to require private interests — or their lobbyists — to disclose such details. Campaign records help fill in a part of the picture: Long Nyquist and Zaborney's lobbying firms have PACs that, since 2014, have donated $425,961, largely to Republican state legislators and campaign committees that support them. Adav Noti, senior director of trial litigation for the Campaign Legal Center, a nonpartisan group of election-law experts based in Washington, said few companies handle both campaigning and lobbying. Combining the two presents "more or less the same ethical issues that you have when you have lobbyists in general who are making campaign contributions or otherwise helping officials in office. If you have somebody that's helping a candidate get elected, then when they do come around to lobby that candidate, they're going to have more access and influence than other people who are active on the same issue," Noti said. In an interview, Zaborney said he takes pains to keep the political and lobbying sides of his businesses separate, and that he is the only staffer who works in both spheres. He does not believe that gives him a leg up when lobbying legislators. "I don't play golf, so I don't take members to the golf course," Zaborney said. "I don't drink, so I don't take members out for drinks. Other lobbyists do that. That doesn't give them an unfair advantage. That is just them doing their jobs." Portraying legislators as beholden to him or anyone else is selling them short, Zaborney said: "People whose campaigns I've worked on have opposed me vigorously. And there have been times when people who I tried to defeat helped me on an issue. Legislators are strong enough to stand up for what they believe in." Long echoed those sentiments, but also said efforts to prevent people like him from doing both campaign work and lobbying would amount to a constitutional violation. "Courts have been clear that lobbyists are carrying out the right to petition the government for folks who have retained their services," he said. "Equally, you can't ban folks from being involved in campaigns, because courts have found that it is protected activity." Long said concerns of undue influence betray a misunderstanding of what lobbyists do: "Lobbyists present information on behalf of our clients to members – but it's the members who make the final decision." Critics say gauging their impact requires looking no further than the state's current budget impasse. Talks stalled over the summer, in part because of disagreements over expanding gambling — and in particular, whether to allow bars, taverns, truck stops, and other establishments across the state with liquor licenses to house up to 40,000 slots-style machines called video gaming terminals, or VGTs. Zaborney's lobbying firm represents pro-VGT interests; Long Nyquist's company represents the casinos who oppose them. Republicans in the House — where Zaborney's firm does much work — supported legalizing the games. Republicans in the Senate, considered more Long Nyquist's territory, balked. "It was the battle of the influence-peddling titans," said one Republican political consultant who spoke on the condition of anonymity in order to protect business relationships. "And it was cutthroat." At the height of budget negotiations in late June, Neuman, the Washington County Democrat, tried to amend a lobbying-related bill to ban lobbyists from campaign work. The vote against it was 101-98. Every Democrat voted for the ban, and all but 16 Republicans voted no. Among them: Turzai, Reed, and other leaders who have used Zaborney's firm for campaigns. A similar measure, introduced in the Senate during its 2015-16 session, never even got a committee vote. This year, Neuman said he believes there was support for the ban, and the vote to strike it down reflected colleagues' concerns with the wording, rather than the substance, of his amendment. Neuman will leave the legislature at the end of the year if he wins his judicial election, but he has faith that his colleagues will pick up the issue. "It's encouraging that there was no one speaking out against it directly," Neuman said of the short debate this summer. "That leads me to believe that people support this concept."